I personally hate the fact that the Sims 3 is everything but creators-friendly, and that making custom contents or even worse, full celebrity Sims is a devil's job. At least if you are trying not to make ugly facemasks that are different shade then the skin tone. 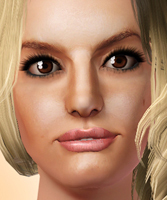 I am very proud of this sim, since thing that she really looks like Jessica. I guess that *cough* some creators will run and make their own versions of Jessica (maybe even the same way) just to prove that they can do it better, but anyways, I truly hope that I have offered you a maximum quality creation. All the best, and enjoy! As for the hair, the hair comes from the Sims 3 Store, and I have purchased the hair by having the original game which is registered, so basically it's not a donation hair.